Here, five tips for starting a healthy, hardy urban farming business in a big city. F&W's #FOODWINEWOMEN series spotlights top women in food and drink in collaboration with Toklas Society. Use the hashtag on Twitter (@foodandwine) to follow along and share your best tips. 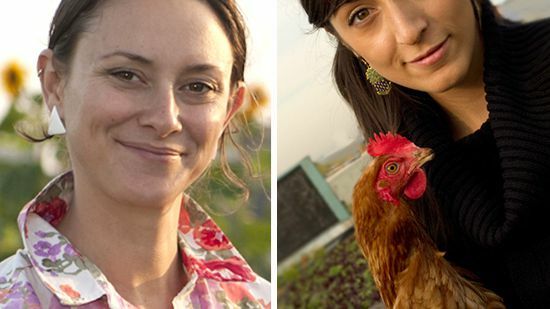 When we started planning Brooklyn Grange Rooftop Farm back in the fall of 2009 with our fellow co-founders, we all shared the goal of creating a fiscally and ecologically sustainable model for urban farming. Our aim was to provide fresh food for our urban community while improving the environment here in New York City. Five years later, we are not only growing produce on our 2.5 acres of rooftop space but also building farms and gardens for our neighbors and colleagues, tending almost 40 beehives around the city, offering programming to help aspiring urban farmers learn the trade and hosting the community for events, yoga classes, workshops and even weddings. There's no way we could ever have predicted exactly what Brooklyn Grange would eventually become, but that's the beauty of farming: You plant a seed, nurture it and let it grow. Here are our tips for starting a healthy, hardy urban farming business in a big city. 1. Create a strong business plan. Urban farming may seem idyllic, but it's a business; know where your revenue will come from and what your operating costs will be. Don't forget to think about how much time you spend working—time is money, and it's a limited resource for a busy farmer! Get a space that is sunny, well-drained and available for the long-term. Don't try to fit a square peg into a round hole: Don't try to grow tomatoes in a lot that's shaded by neighboring buildings half the day or grow produce for food banks in a high-rent space. Try to negotiate a long lease so that you don't invest time, energy and money into your farm only to have it plowed under and turned into an office tower in a year or two. You're also going to want to be close to your sales outlets—farmers' markets, restaurants, etc. ; the biggest advantage to an urban farmer is that you're close to your clients, so take advantage! 3. Be a nimble operator. Farmers don't just plant seeds and harvest vegetables all day. They hook up irrigation systems, fix broken wheelbarrows, paint chicken coops and plug data into spreadsheets. If you don't know how to operate a power drill or a circular saw, now is the time to learn! Never drawn up a budget in Excel before? Time to start dabbling in the world of small business finance. Never say, "I don't know how to do that"—instead, say, "I bet there's a YouTube video that will teach me how to do that." 4. Be a flexible business. Cities are unusual places to farm, so urban farms have to be prepared to do unexpected things besides farming. You can host events and photo shoots to bring in additional revenue for your small business, turn excess produce into value-added products like salsa and hot sauce and host classes and workshops for other aspiring green thumbs. Think of your farm as a venue, an education hub and a community resource as much as a food factory, and be open to trying new things that bring in money and fully utilize your unique space. 5. Don't try to go it alone. Urban farming is a community endeavor, and it takes a village to raise a successful farm. Close proximity to neighbors, your green space and your unique occupation will attract visitors, so you'll have to be social and strong in the area of community relations. See this as a resource and parlay your friendships into opportunities to grow your business and expand your team! We partner with City Growers, a nonprofit offering K-12 education on our farms, as well as the Refugee Immigrant Fund, a job-training program for asylum-seekers here in New York City. Both organizations are amazing at what they do, and chances are there are similar groups doing great work in your city with whom you can team up to really maximize your farm's potential.